Almost everyone knows the "Caroline's star"* by now. It's this bright new star, with a vertical streak, that is visible from every corner of New Eden. * the screenshot of the new star was first published on Twitter by Caroline Grace. Both CCP and players quickly adopted "Caroline's star" as the name for this phenomenon. But there is more to it than just a few pixels on the sky. It seems that the recent supernova in Jovian space has destroyed almost all stargates in the following regions: A821-A, J7HZ-F and UUA-F4. But now, when you open your map in game and set all jump lines to be shown, you will notice there is no jump connections in Jove space anymore! Also please notice how the epicenter pinpointed by NPCs players in this ingame news item happens to be exactly in the middle of the cleared area. This answers the question why CCP has removed Jovian graphical assets from the game earlier this year. There are no Jovians left. I am probably safe to say that by now all the Jove are gone! This also let's me believe that the whole "Stargate Building" thing shown by CCP Seagull during the last Fanfest will most likely happen in the post-Jovian regions of space. 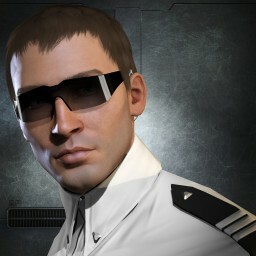 Of course nothing has been confirmed byt the CCP yet.